(T his post originally appeared as our response to a question on the Legal Marketing Association list serv). The trend for many years has been to eliminate listing all lawyers on firm letterhead. For at least 25 years of which we are aware the move has been to personalized stationery with direct dial numbers shown. The practice of listing all lawyers is quite dated, and fits an era when law firms were all much, much smaller, and none, literally none, were more than 100 lawyers, as I remember being told. 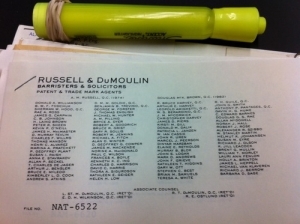 Some folks older than I may be able to peg the date the first law firm hit 100 lawyers, but I think it was sometime in the early 1960’s. It seems inconsistent that firms that want to show they are current as to their legal knowledge and use of technology would hold on to a dated, arguably antiquated, practice like this. Such letterhead makes exactly the wrong impression upon receipt. With an estimated 80% of all business communication via email now, letterhead design is not the mission-critical decision it once was to a firm. Look at it another way: if it made sense to list every lawyer in correspondence why is no firm using a template and listing all lawyers at the top of all of its emails? That would be, well, silly. Email started popping up commonly in 1996/1997, with the advent of Hotmail. That’s 20 years ago, so the practice of listing lawyers is arguably nearly two decades out-of-date.